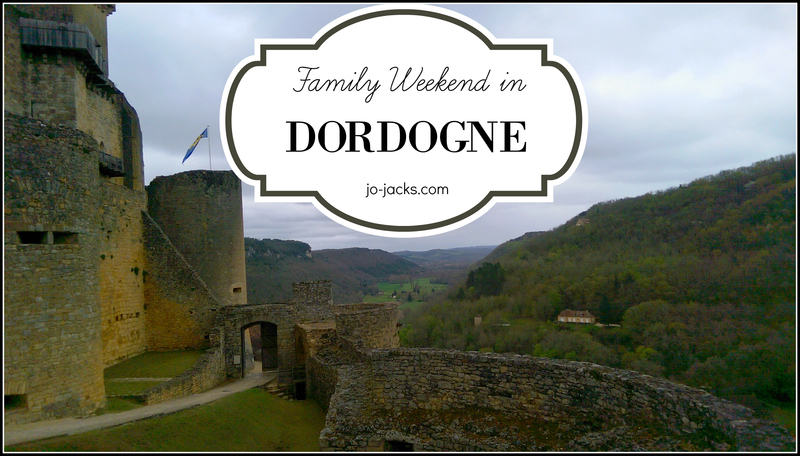 Our Dordogne family weekend is a breath of fresh air after our travels through France, starting in Paris, then down to the Loire Valley, to Bordeaux, and finally to the Dordogne valley. 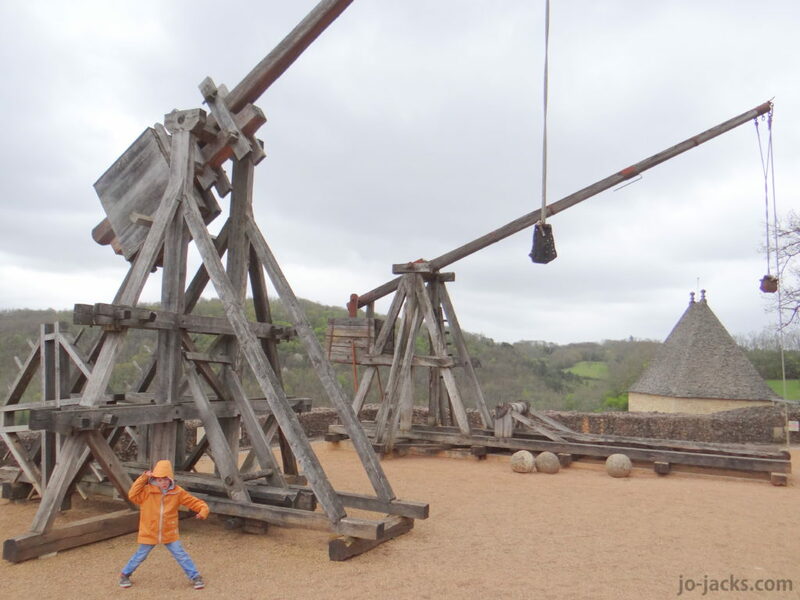 We finally have found the perfectly balanced travel destination in France that has something for everybody. 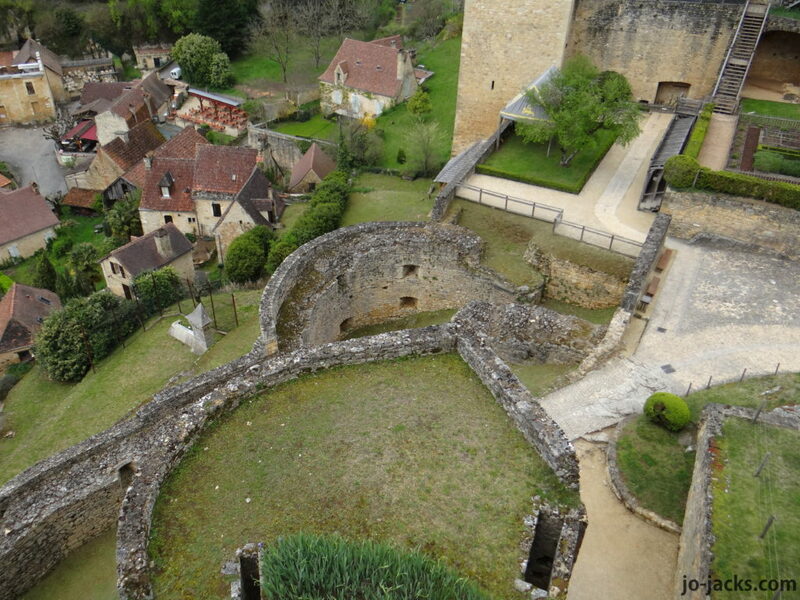 Dordogne family friendly options are bountiful: castles, caves, gardens, canoes, markets, delicious easy-going meals, and family-friendly hotels. 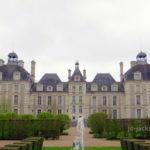 This is a fantastic castle to visit with children. My boys love weapons and warfare. 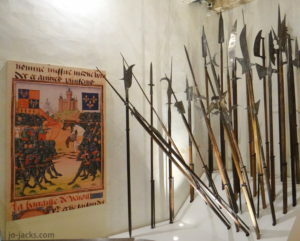 So this castle, which is all about medieval warfare, is heaven for them. 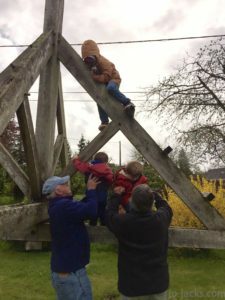 This is a must include for a Dordgone family weekend – it is sure to impress. Visiting on a rainy day in mid-April, we practically have the castle to ourselves. 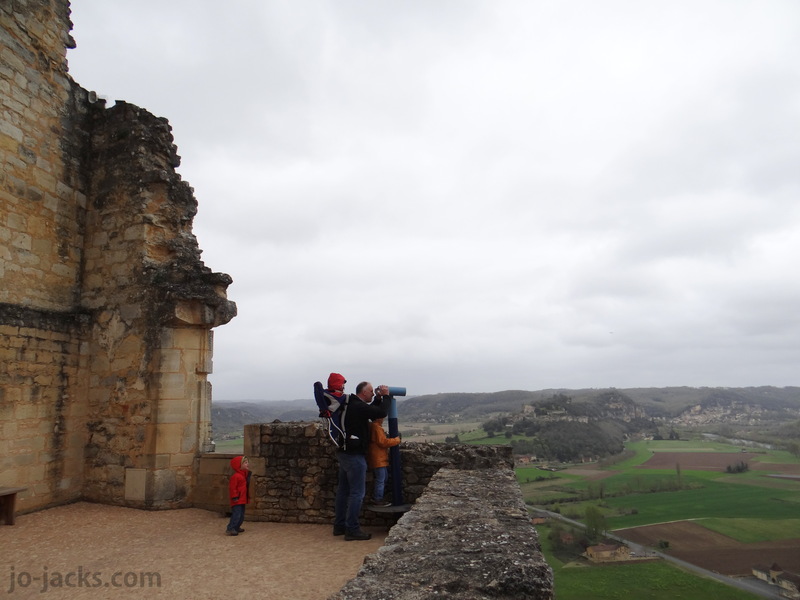 The view over the river, green valley, and medieval village is spectacular. 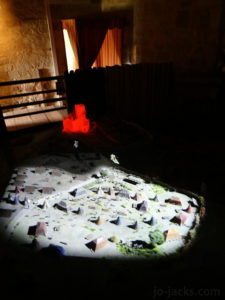 We love the room with a diorama display that explains the seize of 1442, when France fought England here. My boys insist we watch it 4 times. 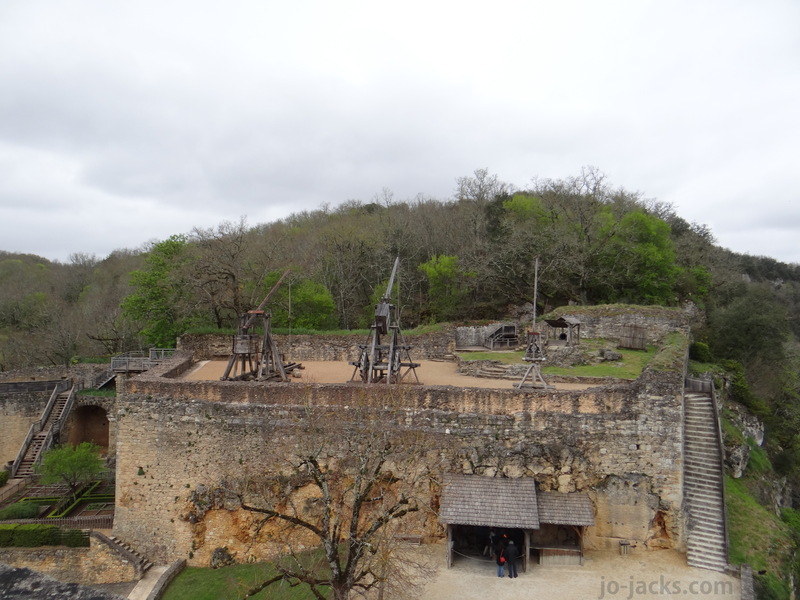 They also love the blacksmith display and seeing the trebuchets. 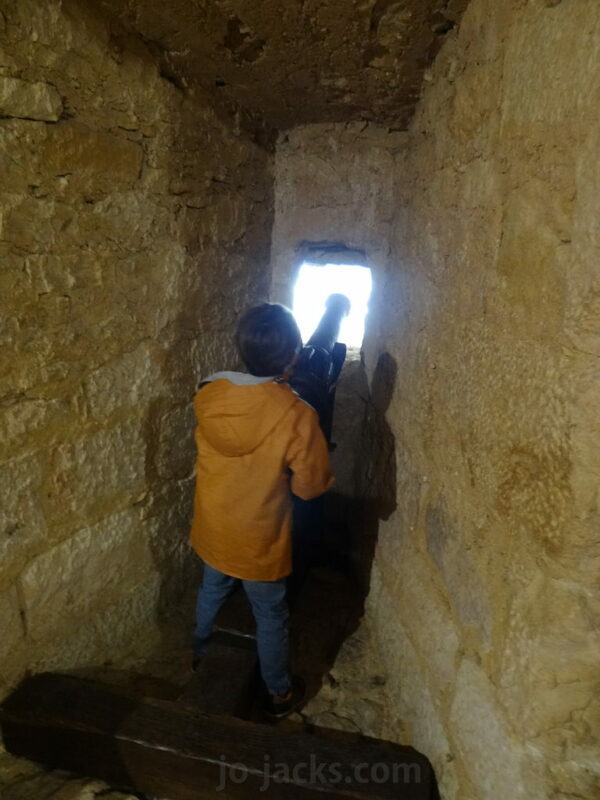 The rooms full of weapons are impressive – but not as much as the privy room – a hole you sit on where you can look down for what seems like a mile. Imagine peeing there! 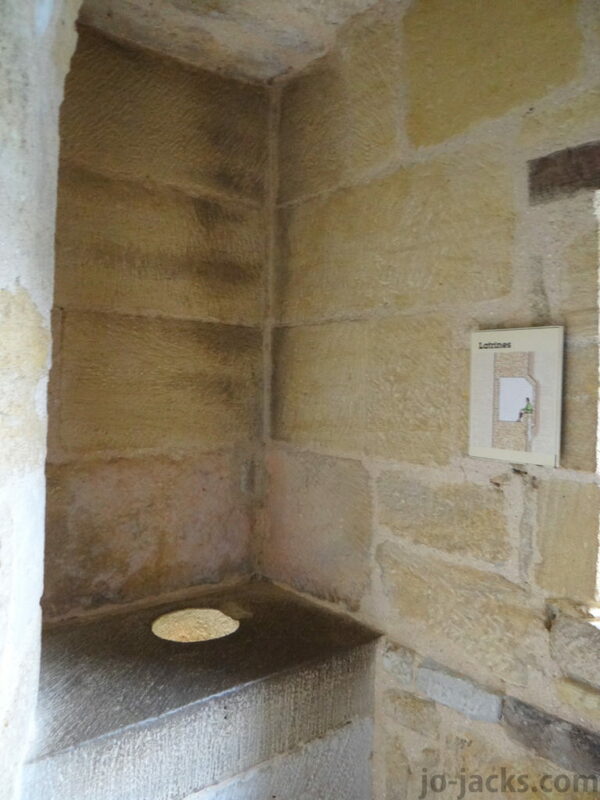 The fascinating privy hole – quite the drop! 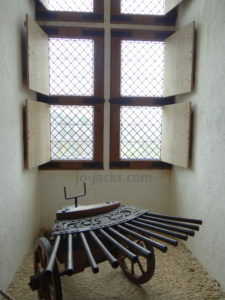 There is a great blacksmith display, and on busier days they have more activities for children – such as jousting. 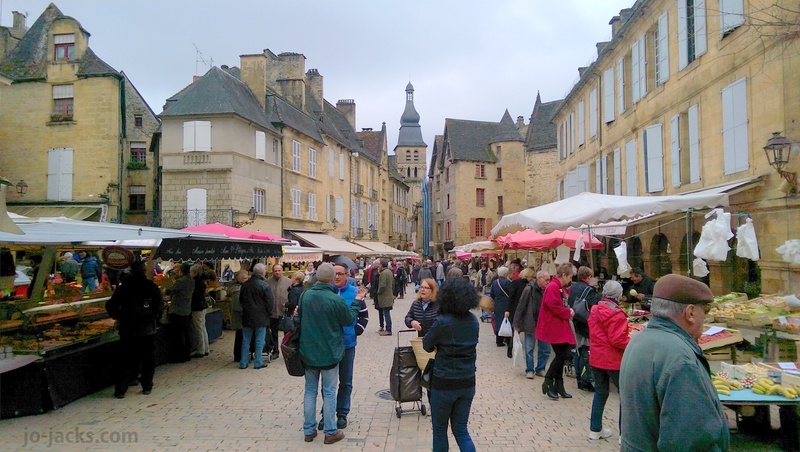 A Dordogne family weekend trip must include a visit to a town market. 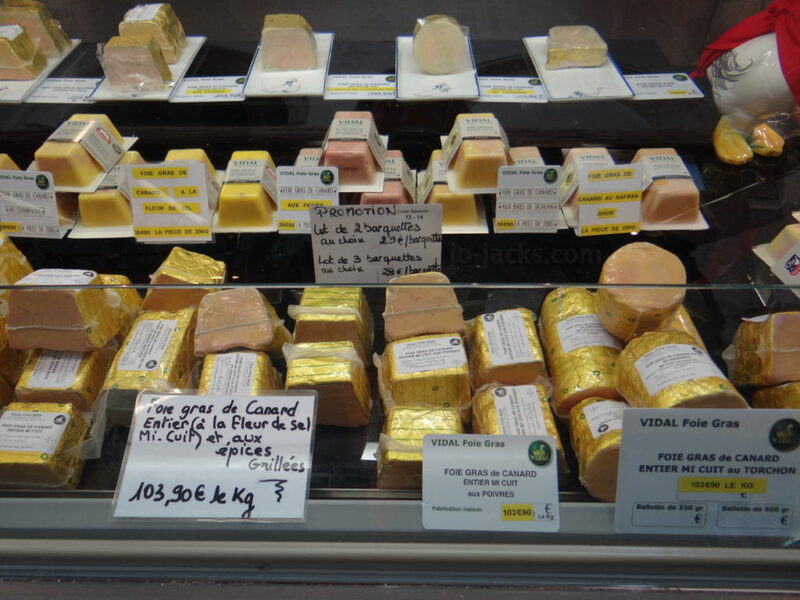 We stock up on cans of foie gras here as well as sausage. Even in the rain, the smells of the food and the colors of the stalls make it a cheerful day. 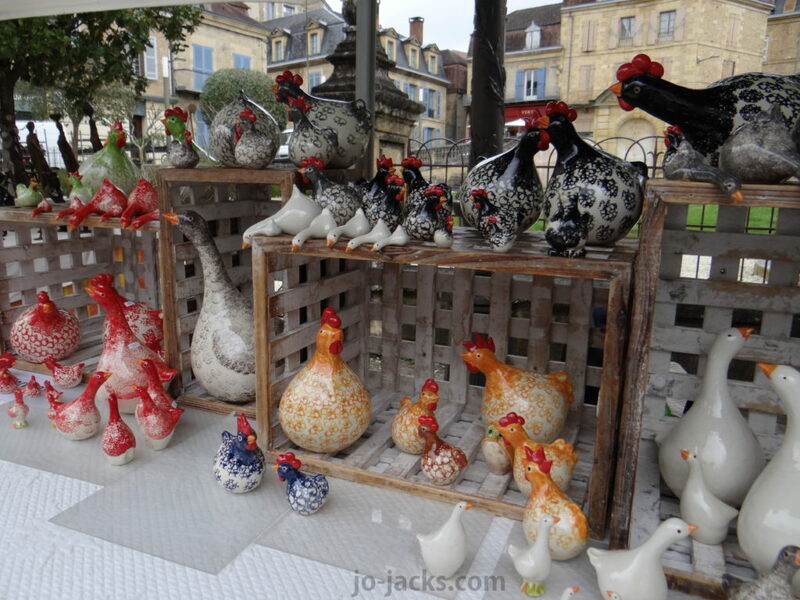 Our favorite Dordogne market is the Sunday morning market in the quaint town of Saint-Cyprien. 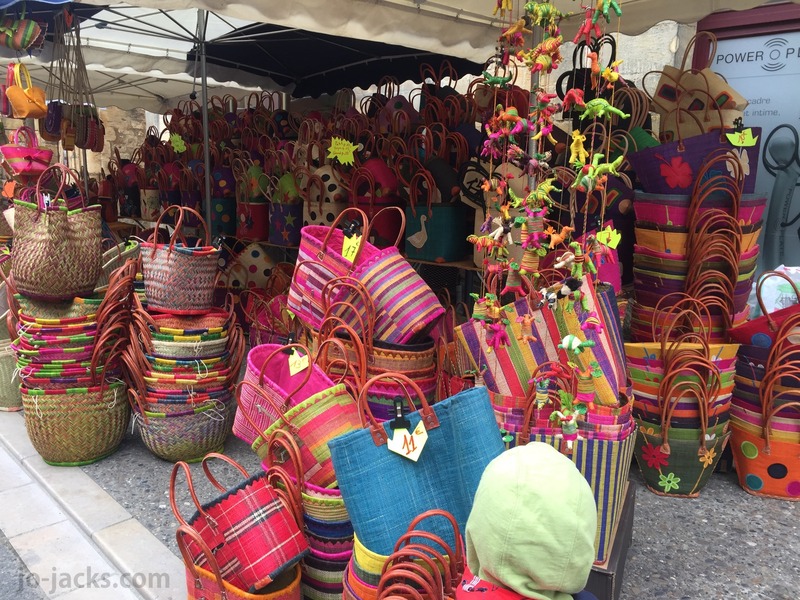 One wonderful feature of these markets is that suddenly you start to see many children. 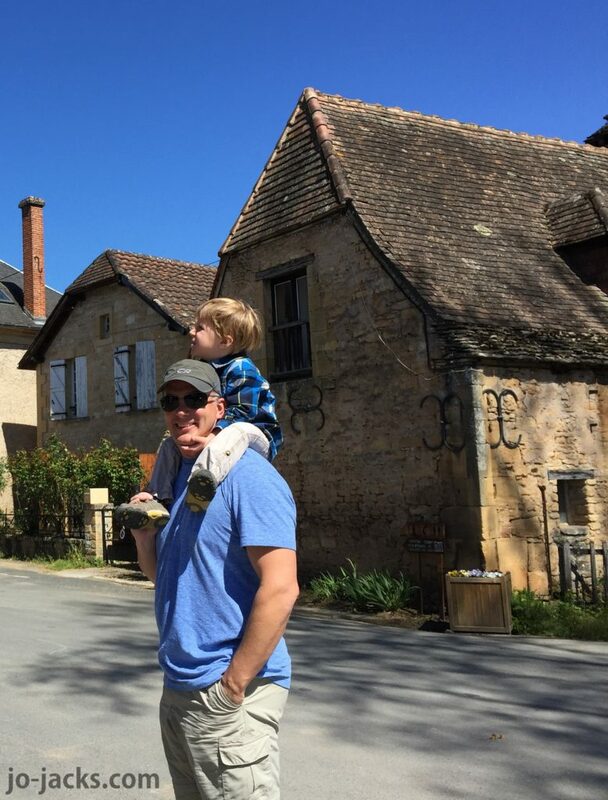 There were other times in France (with the exception of Disney) when we felt like the only people in the country procreating. Here, many families are pushing strollers or carrying kids in backpacks. We make it fun for our children by having them help locate and taste certain foods (strawberries, foie gras, cheese, chestnuts, sausage.) They also help us count out the money and practice some phrases in French when making purchases. 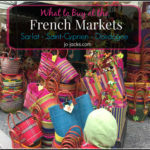 See my post on What to Buy at the Market at Saint-Cyprien. Children love walking through this cliff side settlement that has been inhabited for 50,000 years. 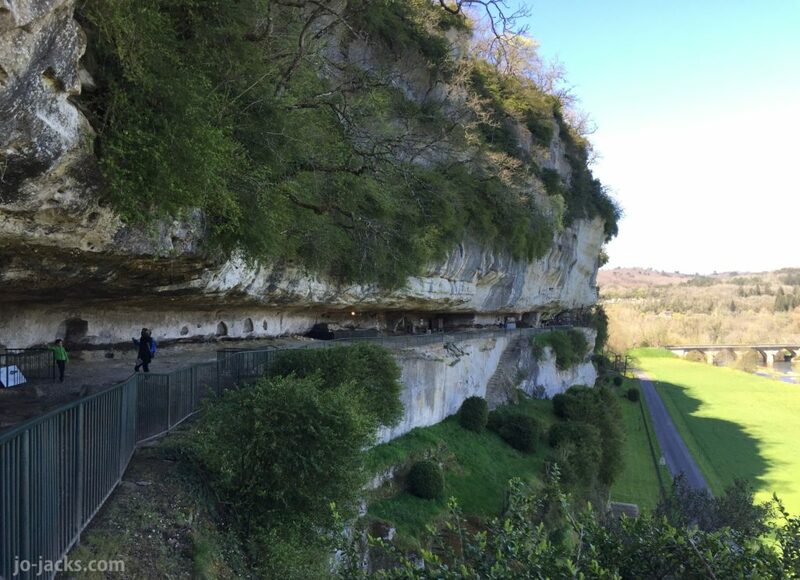 See how families would have created homes and churches in the cliff and used the site along the river for protection and trade. This self-guided tour takes about 45 minutes to walk-through and had great displays. I don’t recommend bring a stroller here. 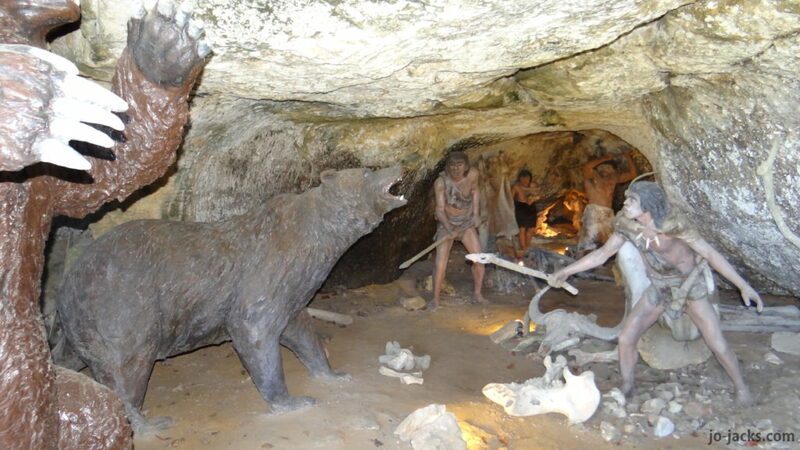 This scene of cave dwellers fighting bears gave my 3 year old nightmares! 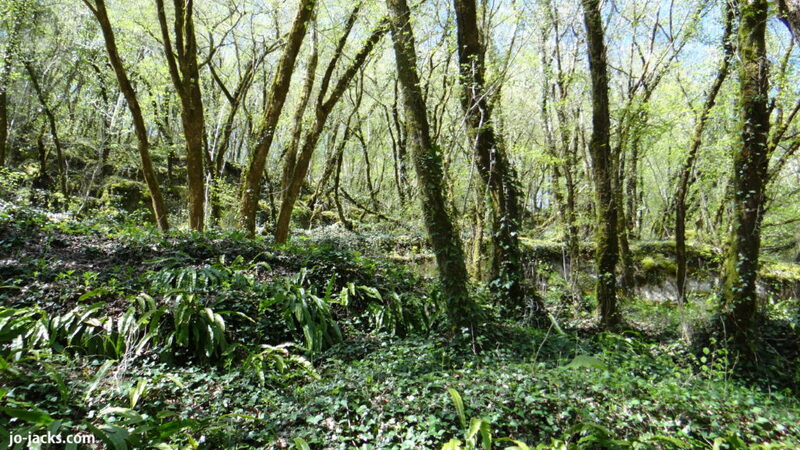 Also, the parking lot area along a stream in the woods is a very nice for picnicking during a Dordogne family weekend trip. Saint-Léon-sur-Vézère is a beautiful and quaint town on the gorgeous Vezere river. It is the perfect sport for a lazy lunch along the river, a canoe ride, or just a ramble along the banks. 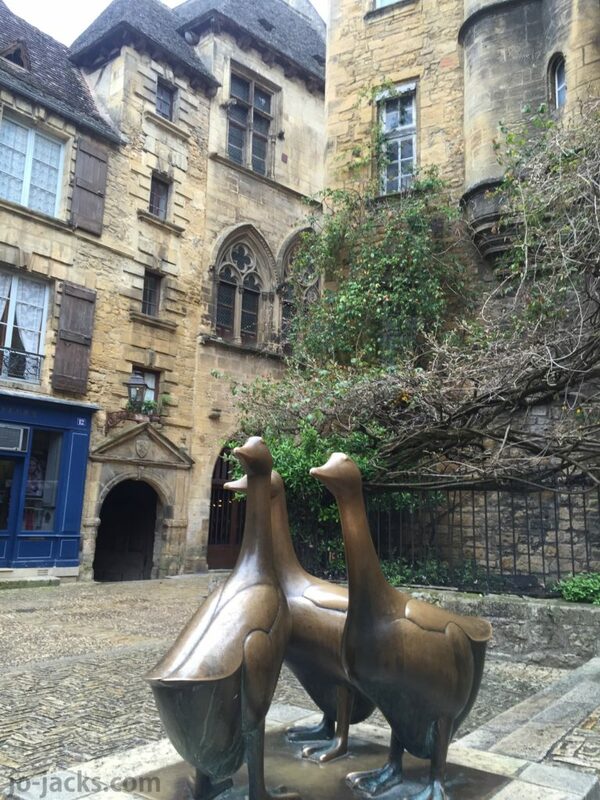 The town is one of the French recognized Beaux Villages – a well-preserved, and beautiful villages. We enjoy salads, a bread basket, and a glass of rose at Le Petite Leon, (also has children’s menus). The setting is charming as we look out at the river, with tulips all along the banks, and weeping willow branches dipping into the waters. We take a walk past the 12th century Romaneqsue church, along the riverbank – gazing at cliffs and country-side inns and homes. My boys try to skip rocks across the water. 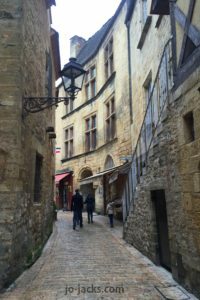 Saint-Leon feels far from the more touristy and busy towns of the Dordogne. We are disappointed we can’t go canoeing, as the river is too high from all the recent Spring rains. Next trip! 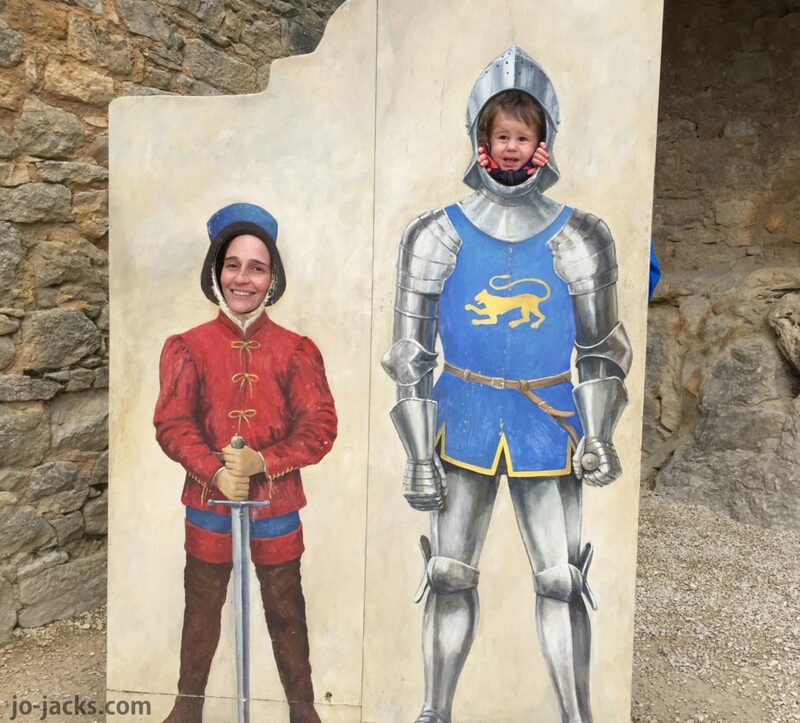 We are loving our stay at the B&B Le Chevrefeuille for our Dordogne family weekend trip. 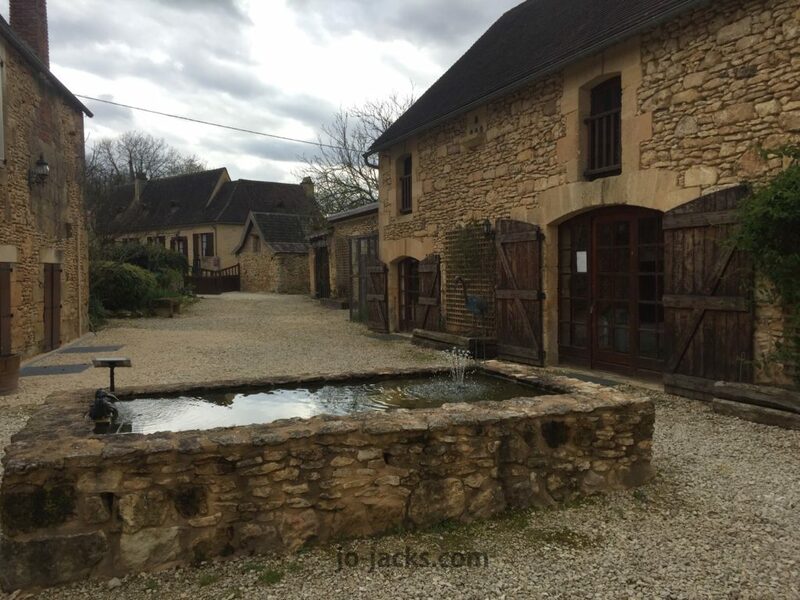 This is a country inn that offers rooms on a b&b basis or self-catering gites. Best for our family is the roomy and comfortable family suite, the playroom full of toys, and a self-service washing machine. 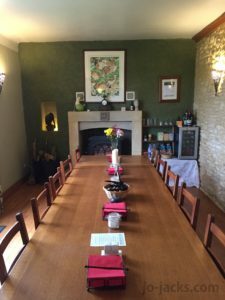 The owners and proprietors of the inn, Ian and Sara, are so insanely friendly and helpful. 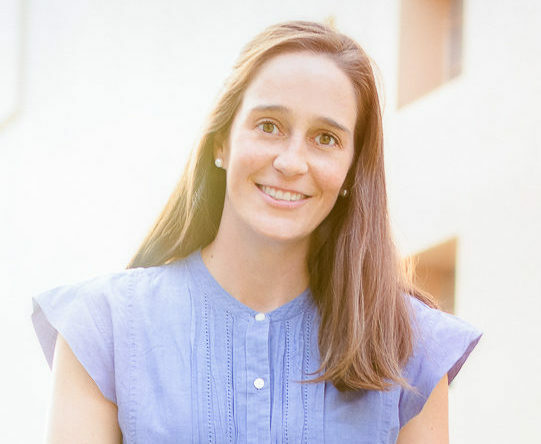 Sara goes the extra mile to offer up a dry spot for drying clothes, making dinner reservations, saving us with an emergency stash of diapers, providing small bits of olive oil, and generally making our stay wonderful. Our boys love playing with her children. 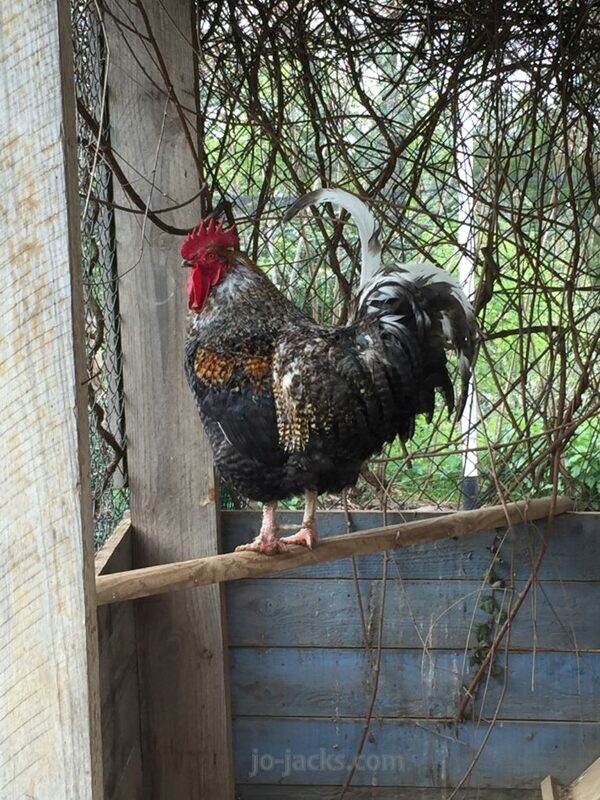 They run around the backyard, climbing, playing balls, and feeding chickens. Meanwhile my husband and I kick back with our gourmet picnic food from the market and a bottle of wine, and can truly relax. We have had many dining experiences in France where we spent the whole meal shushing children and chasing a toddler. Here we can breathe, relax and laugh. Ahhhh. I don’t want to leave! 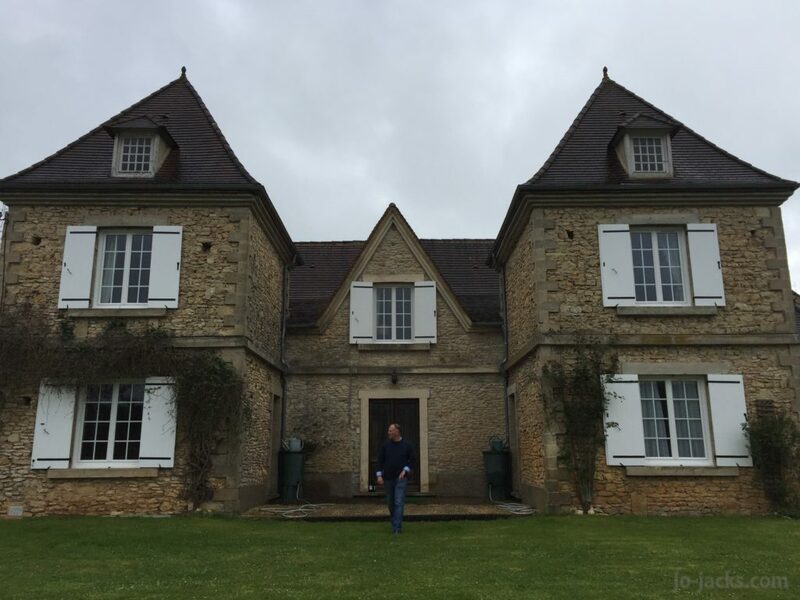 Our one disappointment of our Dordogne family weekend trip is that as we are visiting in the off-season, we do not get to experience Ian’s famous meals, which are supposed to be fabulous. Next trip! 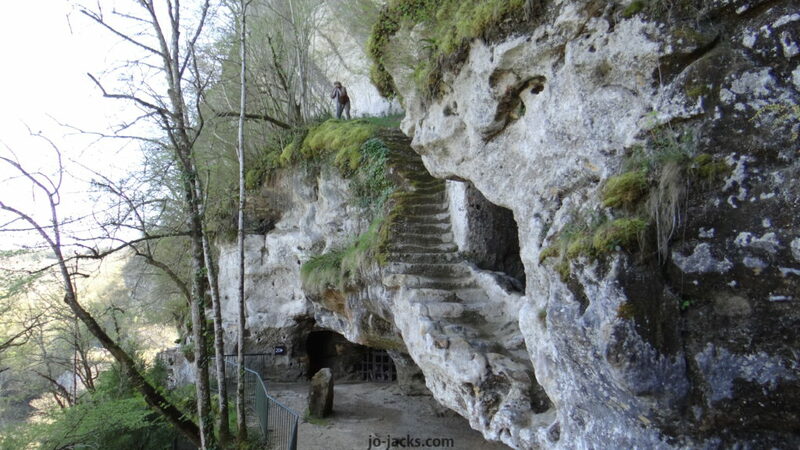 Next we go to see the famous caves of Lascaux. 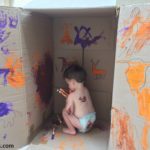 To be honest, this is not a great experience with young children, or for any of us really. We have difficulty understanding our guide’s English, and “noisy” kids are asked to leave, so I spend the whole time trying to have them whisper. My 3 year old has no idea how to whisper! The cave is a bit underwhelming too. I know it is so historically important, and I was very excited about this visit, but I didn’t feel all that moved by the site. Then I had to take my fidgety toddler out half-way. 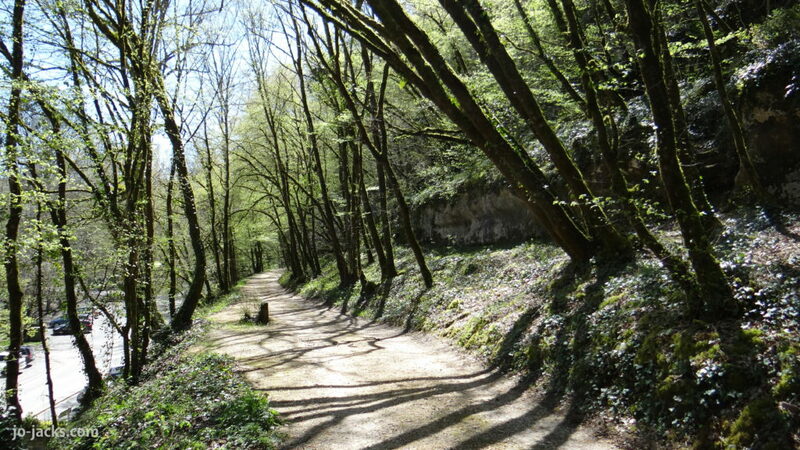 Since I had to leave the cave with my noisy toddler…we did a small hike in the woods instead! A huge visitors center is being built and is scheduled to open in late 2016. Hopefully that will have more interactive displays – so maybe it will be better for families then. 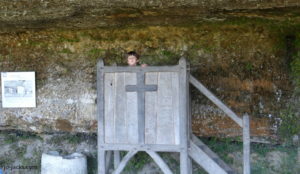 But for now, for families with kids I would recommend going to the Grotto Rouffignac instead. It has an electric train you can ride through a huge cae and is generally much more child-friendly. 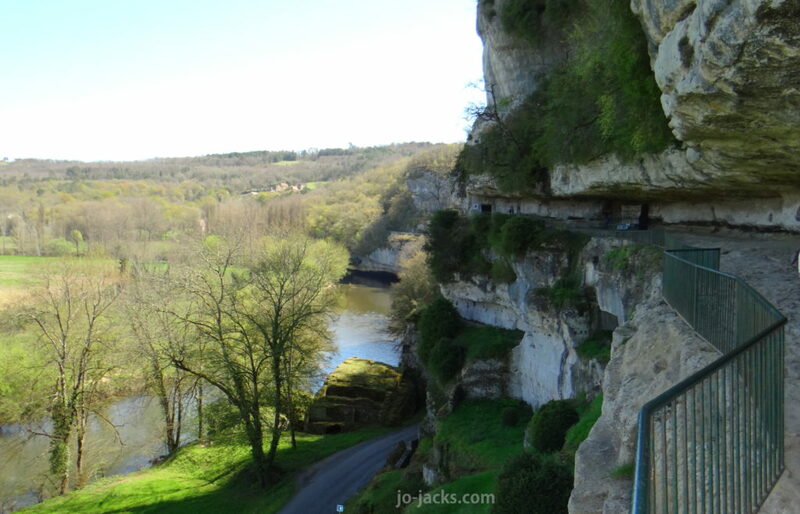 Drive from Les Eyles up the Vezere river valley. 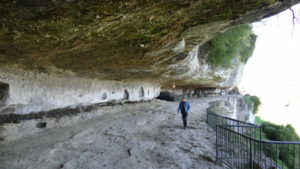 Grotto de Rouffignac (1 hour). 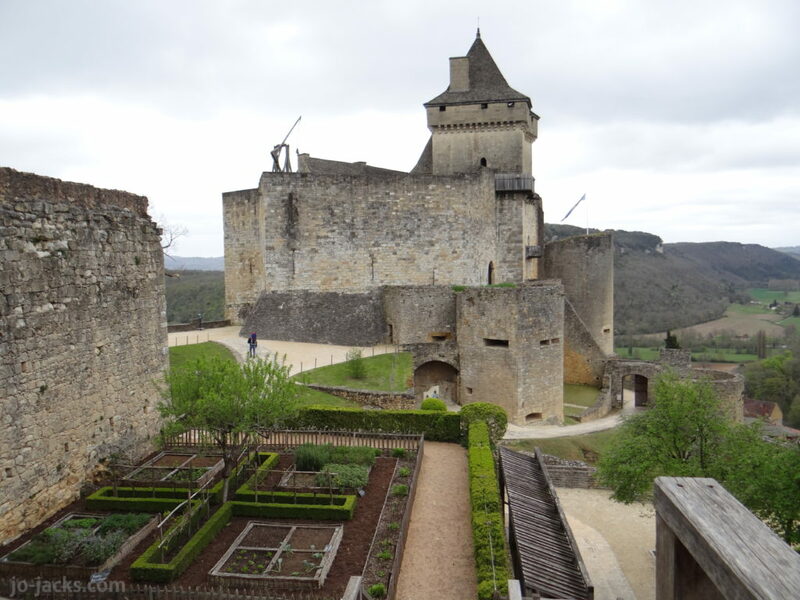 Have your been to Dordogne? What did you love? What should I add to the list? Or take off! Let me know in the comments.